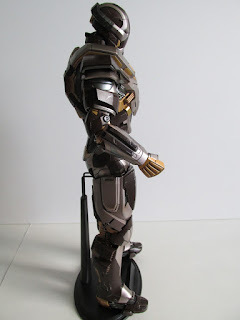 Who wants more Iron Man Hot Toys Figures! ?...not many I guess. Hot Toys has been releasing quite a bit of Iron Man figures and this includes this week’s look at their latest exclusive release, Mark 24 Tank. 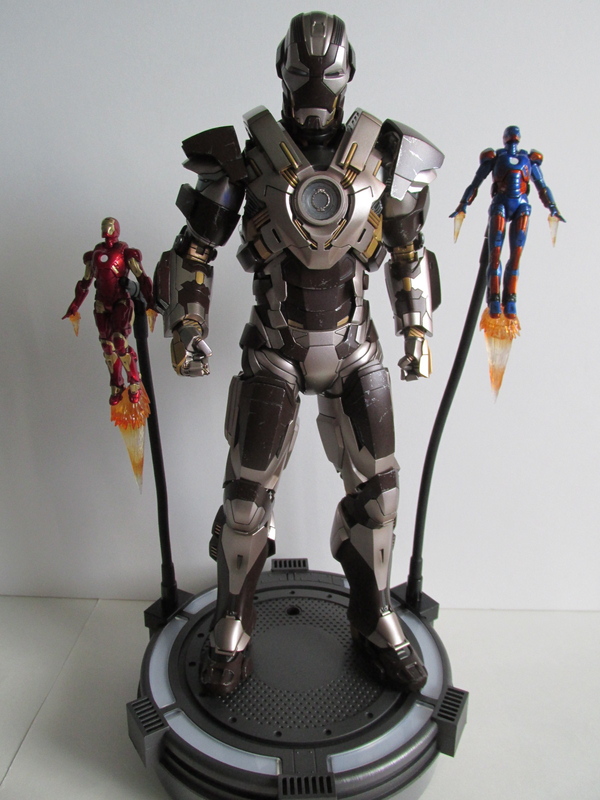 Like many collectors out there, I too am getting a little fatigued with so many Iron Man releases. I bought this immediately, but after I had some doubts and regret. 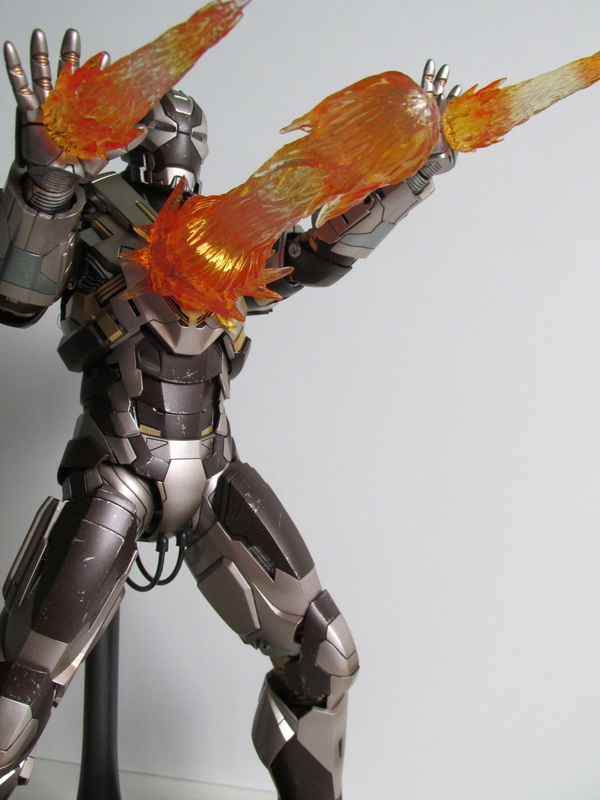 However, I can happily say that in hand this figure has actually surprised me. I mentioned in previous Iron Man reviews that paint variants make a difference and this figure is no stranger to that. 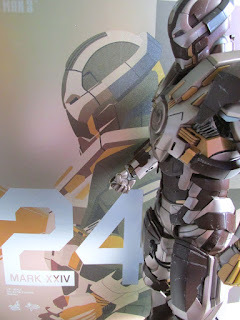 When I first opened the box, I was expecting it to be just another Iron Man, but after taking it out I saw how sharp this figure looks simply because of the paint variation. Tank is a brown and gold repaint of Hot Toy’s previous release Heartbreaker. This release seems to have improved upon some of the joints of Heartbreaker, and it doesn’t seem as fragile. In fact, Tank’s shoulder blades are a lot more flexible and not as clunky or delicate as Heartbreaker’s. You still need to be gentle, but the shoulder blades are much easier to work with this time around. 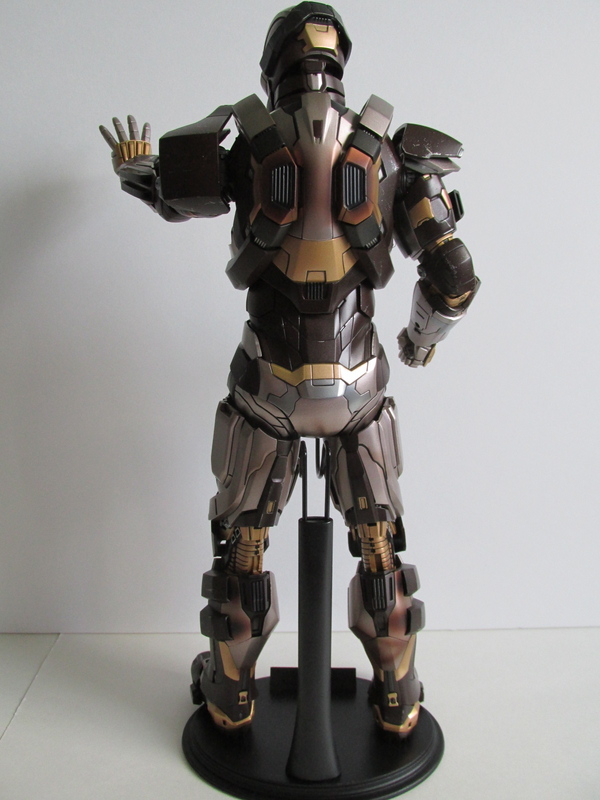 The brown and gold paint job just looks fantastic, and I’m loving the oxidized metal look on the back thrusters and on the back of the legs. We haven’t seen too much of this oxidized metal look on an Iron Man and that is a welcome addition from my point of view. Accessories wise he comes with a somewhat healthy amount of extras. 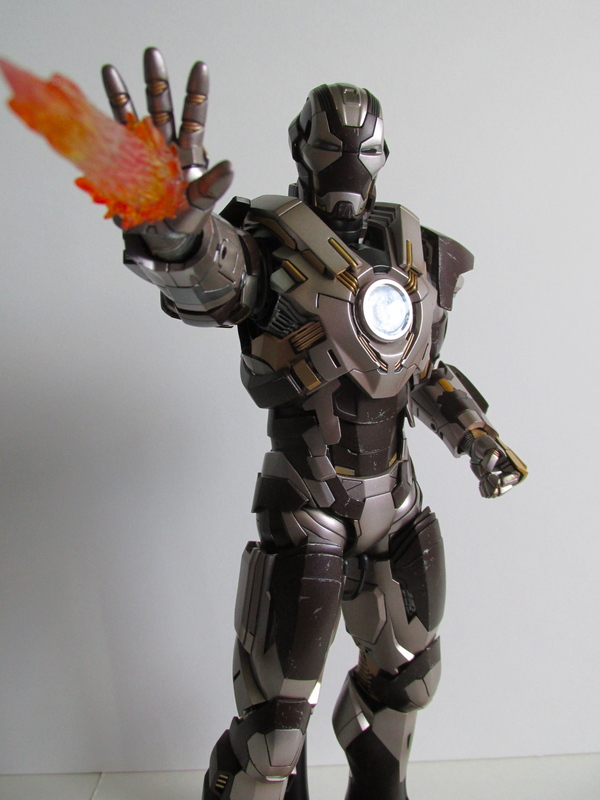 He comes with a pair of repulsor hands, a pair of fists, a pair of articulated hands, a pair of repulsor hands with flame effects, chest piece flame effect, Iron Man 3 base, mini Mark IX, and mini Mark XXVII. 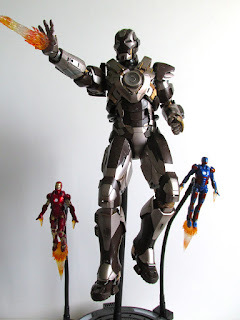 I like the mini figures, and it is a nice touch to doing a huge Iron Man diorama. The figures are non-articulated so don’t try to remove the flame effects or try to pose them. They come with two rods that you simply affix to the grates on the main base for Tank. Now we come to the controversial flame effect accessories. Many people don’t like them because of their toy like appearance. 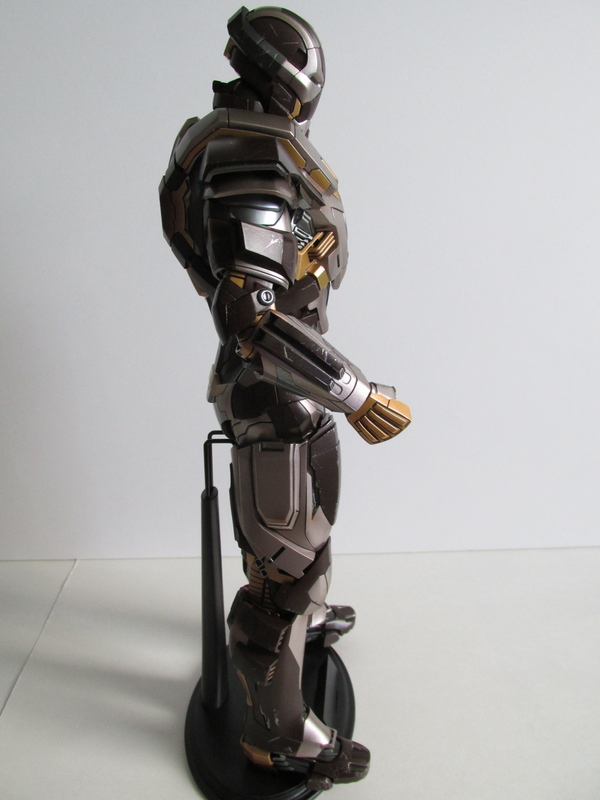 I do think they look toyish, and there can be some kind of improvement on them. 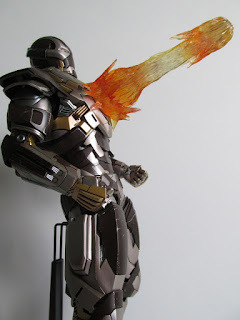 However, I appreciate Hot Toys attempt and think this is a step into the right direction in terms of getting more out of your figures. 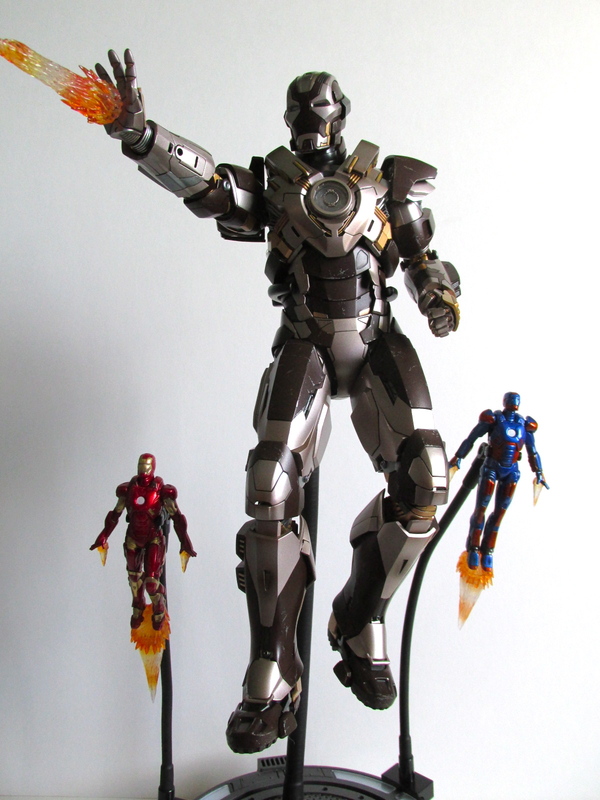 The best thing is the flame effects change up your Iron Man display and gives a better variation of poses. 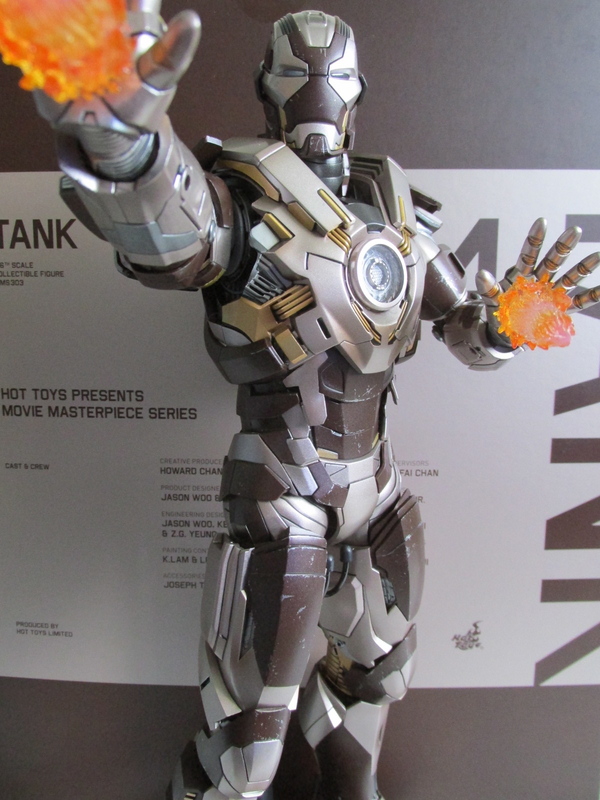 I mean you can only use the repulsor pose only so many times before it becomes boring. 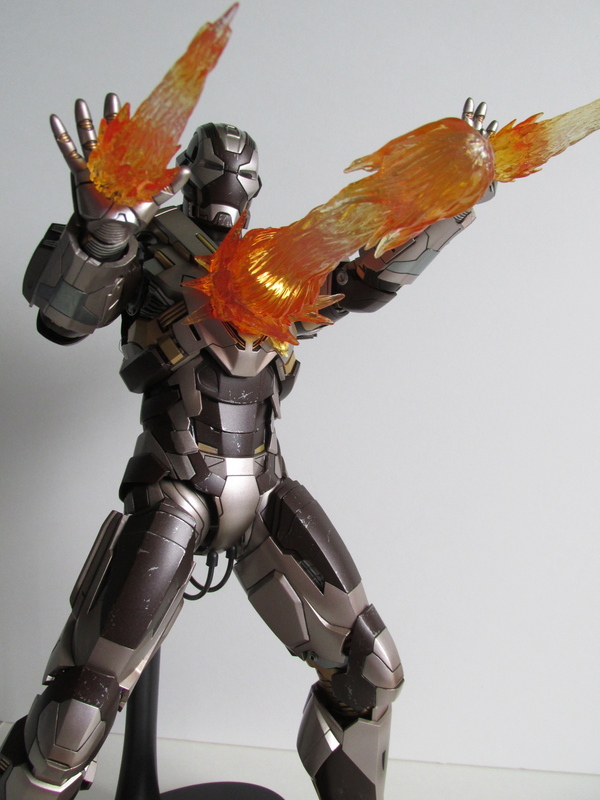 In hand the flame effect looks great and adds a more dynamic look to the figure. It is also worth mentioning that you cannot detach the flame effects from their hands and the chest flame can't affix to other Iron Man figures correctly. 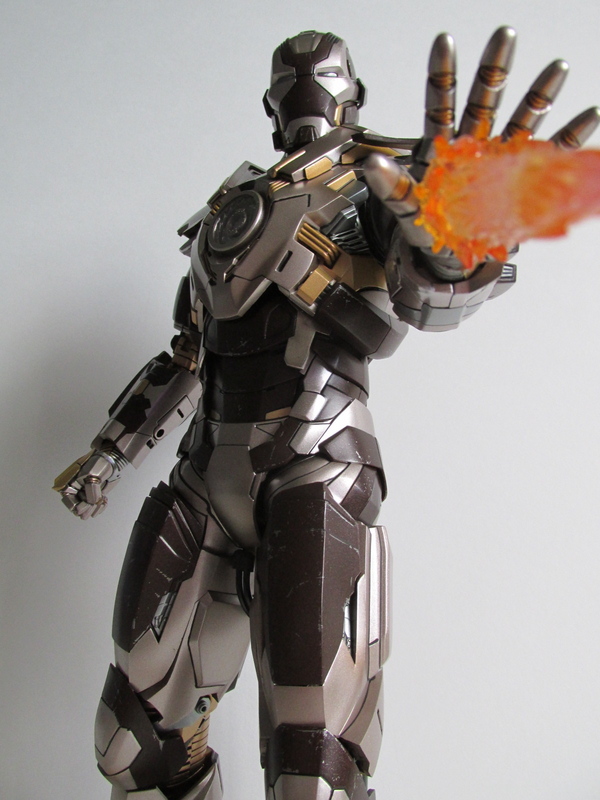 All in all, I do like this figure and don’t regret too much for buying this. I recommend this figure for the die hard Iron Man fans and for collector’s who have the shelf space and don’t mind another Iron Man. 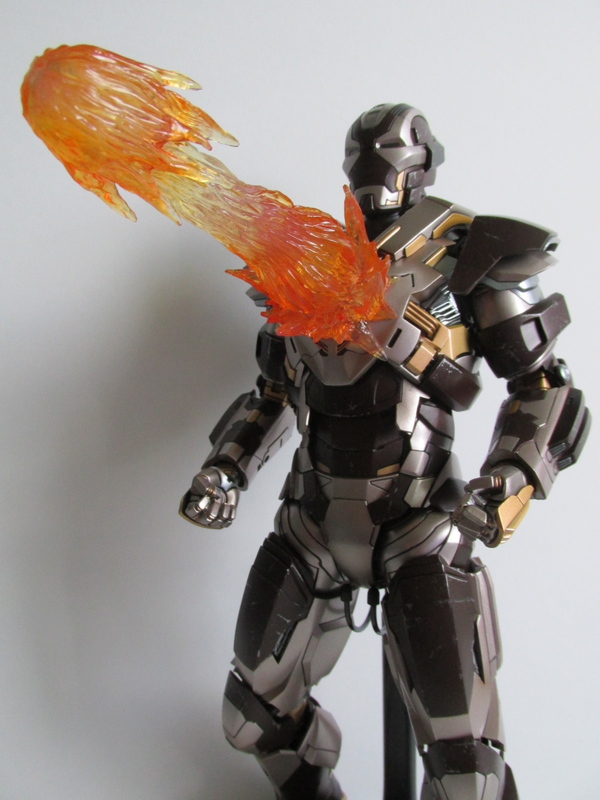 For everyone else, you aren’t missing too much with this release, but if you do find yourself having doubts just know that this is one of those figures that looks way better in hand. As they say, photos just don't do it justice. 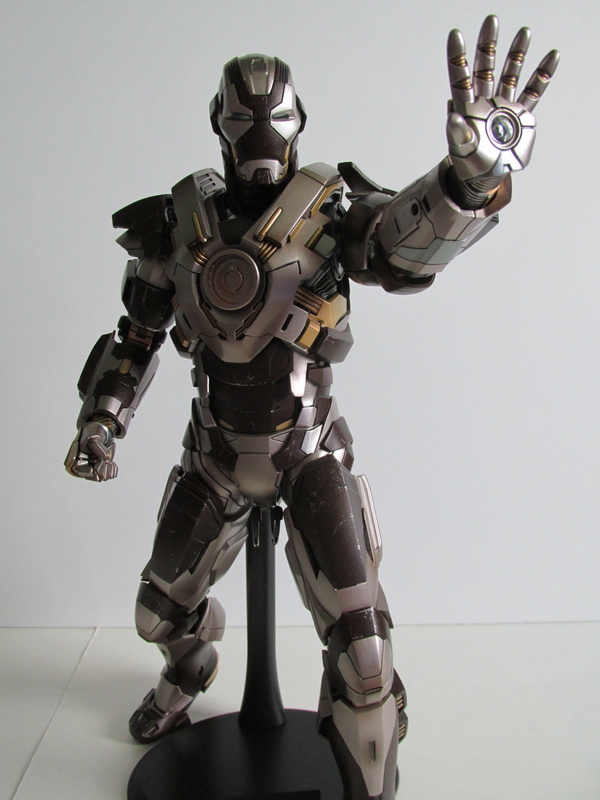 If you have decided to make that choice, you can buy this figure at Sideshow Collectibles here!